BEREA, OH – When I recently posted my “Year end recap…” I fully expected that I would not get to fish in the last few days of 2015. Surprisingly, the unseasonably mild weather and some other favorable circumstances found Bryce and I fishing at Wallace Lake the day after Christmas. The hangover spoken of in the title isn’t related to anything alcohol related, rather the emotional refueling required after getting a 4 year old and nearly 2 year old through Christmas. This trip was somewhat on a whim and the fact that my 4 year old was eager to tag along, kept expectations low. I took very little tackle and assumed Bryce would wear out quick. I was lured to the lake by a recent trout stocking that included Rainbow Trout that were fed higher amounts of beta carotene increasing their colors, some Brown Trout, some Golden Trout, and even a single Cutthroat Trout! All of these potential catches made even the shortest of efforts worthwhile. As unpredictable as fishing can be, this marginally prepared for, highly distracted by toy dinosaurs, and completely under geared trip, was hugely productive. In the few hours we fished, I would hook up with 9 Rainbow Trout. Bryce was thrilled and enjoyed helping out and this was his first time seeing live trout. We kept a stringer of one legal limit (3 fish) and it was like looking at myself watching him pull the stringer up to look at the fish over and over. 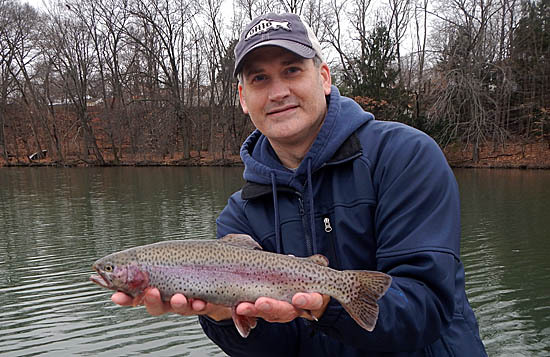 I emailed Cleveland Metroparks one of the photos of him admiring our biggest trout, which ended up being the cover photo for the Cleveland Metroparks Fishing Blog for the December 31st weekly report. It can be seen here. Bryce was very proud of this accomplishment and made sure everyone knew. It would have been very cool to catch any of the other ‘special’ trout that were stocked, but it would be hard to complain about the day’s success. All of these traditional Rainbows had beautiful color and we were fortunate that mixed into our catches was one of the bigger class fish (pictured above). While Wallace Lake continues to be a ‘hit or miss’ fishing venue for me, I am happy that I am having more good days than bad.